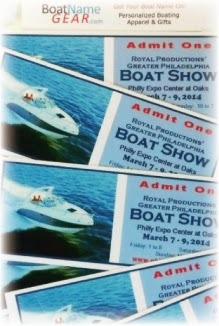 Our friends at BoatNameGear.com are giving away 2 pairs of tickets to next weekend's Greater Philadelphia Boat Show, March 7 - 9, 2014. Win tickets to the boat show! All you have to do is "like" the BoatNameGear facebook page, and send them your mailing address via the private message tab on their facebook page. The first two people to do that will receive a pair of tickets in the mail before the show. The Greater Philadelphia Boat Show takes place at the Greater Philadelphia Expo Center in the village of Oaks, Pennsylvania, located 18 miles northwest of the city. Parking is free, and the show is one of the biggest in the Northeast with more boats on display than you'd expect to see at a show in the suburbs. We checked out the show last year for the first time and were impressed. Lots of boats, plenty of free parking, and really good deals from vendors/dealers looking to move some boats to kick off the spring boating season. Only two complaints were overheard from some attendees... First, there were no sailboats. The show is primarily a recreational powerboat show with no shortage of ski boats, fishing boats and pontoons. Second, the other half of the expo center was hosting a gun show at the same time as the boat show. Some folks didn't like the gun show thing, and others were ticked off that their ticket for one event wasn't valid for both since they were in the same building.